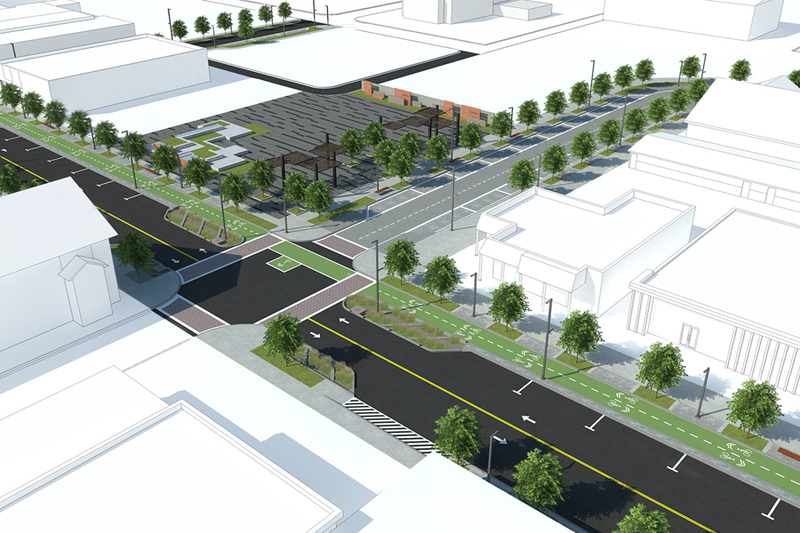 Barksdale Boulevard once again becomes the area’s vital artery. 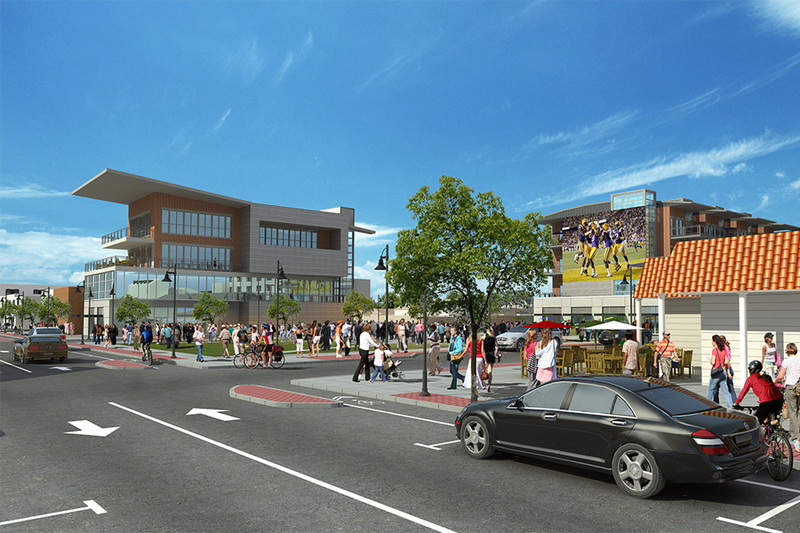 This time around with a festival plaza, new skyline and bike and pedestrian paths serving as the heart of downtown. Reversing the decline became Bossier City Mayor Lo Walker’s enduring passion. Re-envisioning the corridor was part of his unsuccessful 1989 campaign platform. It remained his running point when he won 16 years later. Since 2005, many master plans for revitalization emerged, and not one gained traction until 2014. Walker’s vision got the dose of reality it needed when Computer Sciences Corporation (CSC) announced it would build a technology center at Cyber Innovation Center’s national Cyber Research Park. While the center was not contingent on revitalizing the downtown area, Bossier City had to be prepared. What type of neighborhood and amenities would attract the 800 highly skilled employees CSC would hire over a four-year period? Survey said: unique, mixed-used neighborhood oozing with history and character. “Having seen plan after plan over years, city officials were on the hunt for fresh ideas. Collaborating with internationally-known Mike McSwain Architects, our urban designs and master planning team helped present the plan they’d been waiting for. From branding, wayfinding and streetscaping to the plaza’s design, the focus was on creating an immersive environment at the pedestrian level and less on suburban-type sprawl,” explains Chadd Fuemmeler, SKS Studio’s landscape architect. Revitalizing downtown areas into thriving live, work, play neighborhoods appeals to many, including the vibrant workforce CSC seeks to attract. 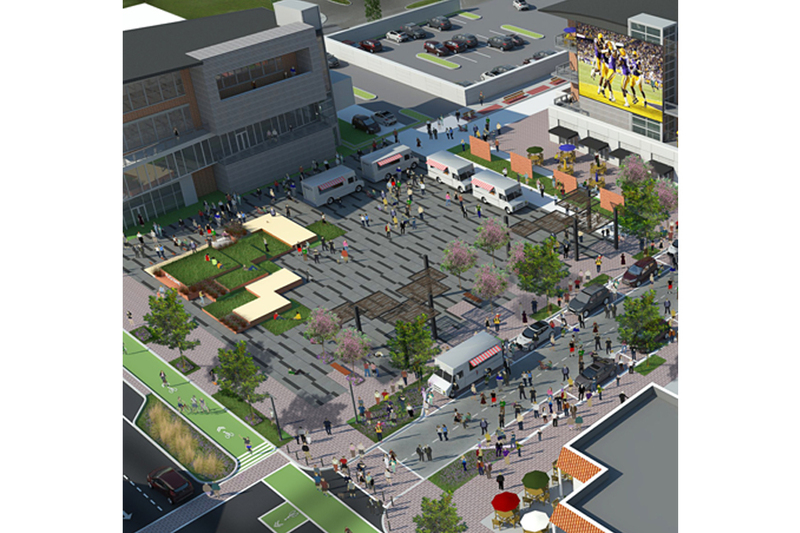 Bossier City’s plan spotlights a rectangular plaza, the epicenter, with removable bollards to close the area to traffic for events, concerts, games and festivals. Mixed use, mid-rise developments surround the plaza with retail on the first floor and residential units above. Behind those, housing options include row and single-family homes – all within walking and biking distance to the plaza. 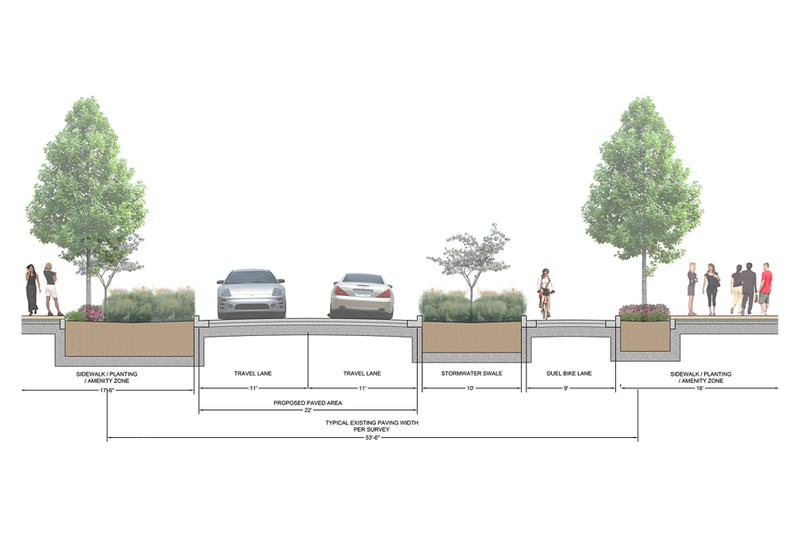 Pedestrians and bikers have separate lanes on the redesigned roadways, including Barksdale Boulevard, a main artery. 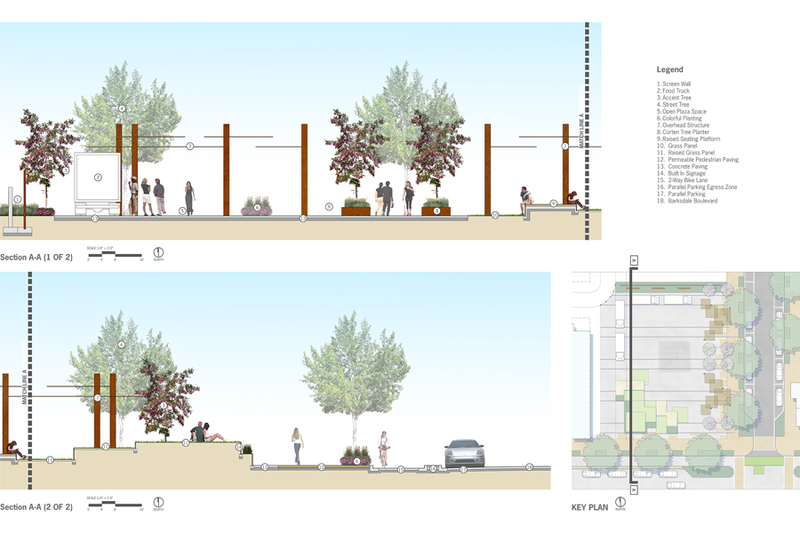 They’ll enjoy innovative streetscape features and technologies like bioswales and LED lighting. Master planning can be easier in undeveloped suburban areas compared to working with existing infrastructures and buildings. 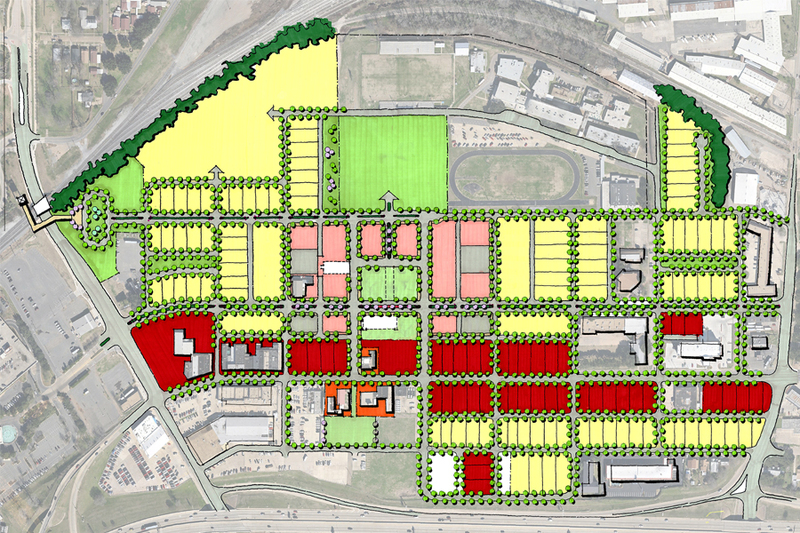 But urban design projects like Bossier City’s Re-Envisioning is full of opportunities, and of course, challenges. The city started with an advantage, already owning many downtown properties. Unique brick buildings and storefronts from the 1920s and ‘30s exude the history and character feasibility studies proved residents, young and old, desired. Mixing old and new in the design was key for the Mike McSwain Architect firm, a frequent partner of SKS Studios, and set the project off to a welcomed start. The Bossier City Re-Envisioning project will take many years to fully complete. SKS Studios has a continued role beyond the original urban design co-planning and landscape architecture. The firm is advising on construction materials and methods, as well as assisting engineers and designers. “Things change when shovels hit the ground. Ongoing, close collaboration is non-negotiable when it comes to working through any hurdles as dirt gets moved around,” explains Fuemmeler. “Mayor Walker and the city council are great to work with, and we feel like we have a personal stake in this project’s success after working with such passionate people. They had a vision. We had a vision. Together it melded to create the heart of downtown that the entire area is embracing, and is truly excited about. Phase 1 alone will set the precedent for greater development in the Bossier City area,” says Sean Simms, SKS Studio president.